“He wanted to come and we wanted to take him and it’s another useful addition to our squad,” said Roy Hodgson in January as Crystal Palace re-signed Bakary Sako after a spell at West Brom. The 30-year-old proved very useful indeed earlier this month when coming off the bench to replace Jeffrey Schlupp as the clock ticked down on a 2-0 win over Fulham. And he ‘delivered one dangerous cross which almost resulted in an own goal’, according to one set of ratings. Atta boy. Sako has basically rinsed Albion of 30k a week, got fit, utilised some game time, then fucked off back to Palace. 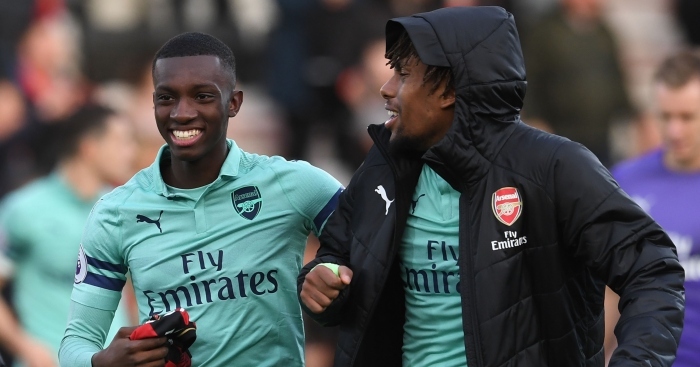 After a grand total of 17 minutes of Premier League football last season, Eddie Nketiah may have expected a little better in his second campaign. So far he has ‘enjoyed’ less than a minute of Premier League football in which he did not actually touch the ball – against Bournemouth in November. He didn’t put a foot wrong (or right) but since then he has been largely stuck on the bench. It’s little wonder that Nketiah was heavily linked with a loan move to the Bundesliga in January; a player with 18 goals in 20 games for England’s youth sides deserves a little more football. The good news? The Europa League is back this week so he will get a little more football. It’s not a lot of fun being Crystal Palace’s third-choice left-back. Even before you dislocate your shoulder. Souare’s one minute of action in what is likely to be his final season at Palace came in the opening game of the season – a 2-0 win over Fulham – when he came off the bench and recorded one interception and three completed passes. Basically, he was brilliant. And he has not even made a top-flight bench since. Then he dislocated his shoulder against Grimsby in the FA Cup. “I’m really disappointed. I’ve worked with him now for over a year and he’s done so well to get back from an horrendous injury caused by an accident. For the last year to be frank, from the first moment I came in he’s been out there every day in training trying his best, getting better and better I think. “Today was the day I was really hoping he would get on the field of play and show what he shows us in training and he would come off the field victorious and happy,” said Hodgson. Obviously not massive enough to earn him a Premier League start as James Milner and even Jordan Henderson have filled in at right-back. Still, fifth-choice right-back Camacho has notched four goals and three assists in six UEFA Youth League games as a winger so his future may lie further up the pitch. That second minute might be just around the corner. “So much as it’s a blow to lose James Tomkins, it’s good to know I have two I can call upon to go in and do a job,” said Hodgson last week. Poor Scott Dann; Roy chose Martin Kelly instead, and Dann still awaits his first Premier League start since 2017. It doesn’t seem to matter to the cold-hearted Palace boss that Dann came on against Southampton and helped them come away with a point last month. One whole header was won and two of five passes even went to a teammate. It seems particularly cruel as Dann has played in two FA Cup games for Palace this season and kept two clean sheets. Dann for England, anyone? Just imagine how easily we’ll beat teams when Scott Dann comes back and we start scoring off corners again. Unfortunately, we don’t have a picture of his face when he was taken off at half-time of that FA Cup replay with Derby. Tyreke Johnson looks like he’s won a FA cup 3rd round start in the local newspaper.